Here’s my personal approach to using this tool. 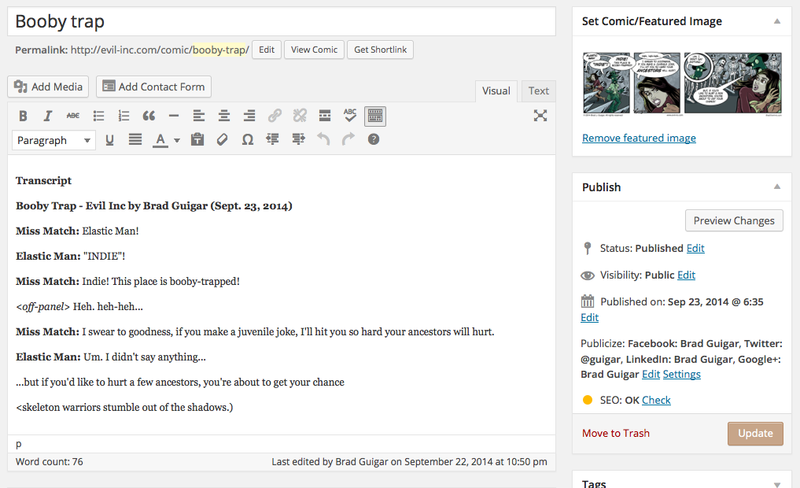 For the record, I’m using Comic Easel — but ComicsPress works exactly the same. I realize that Comic Easel has a field especially for the transcript — and for all I know it may be the better choice. But I can’t figure that field out for the life of me. And putting the text in the blog post suits my needs exactly. 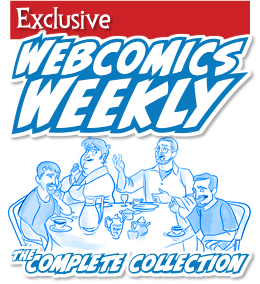 Of course, I have the comic-post blog disabled on my home page in Comics -> Config because I really don’t want this content on my home page. It’s not particularly useful, and it pushed more important content (like actual blog posts) further down the page where they may be missed. 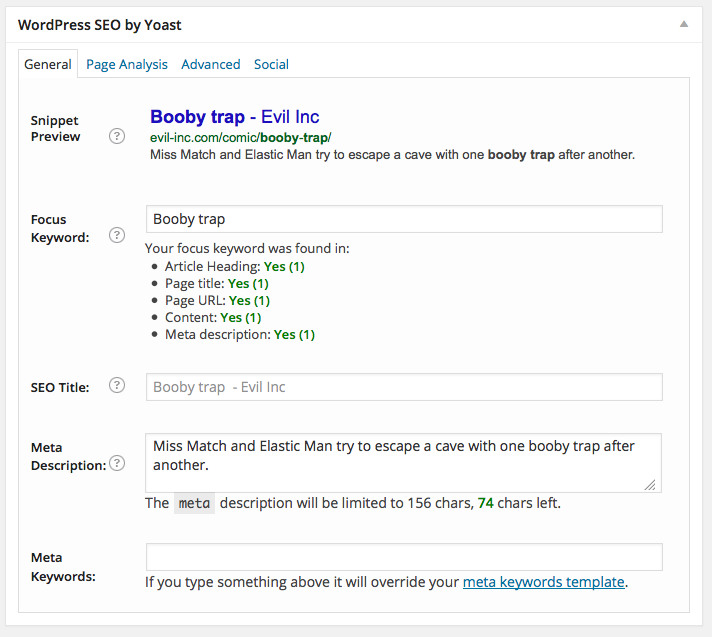 It should be noted that Yoast’s plug-in applies itself to every post type — pages, posts, podcasts, and even comics. 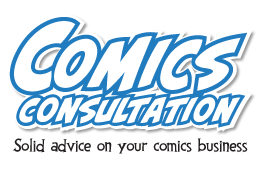 So, in the same way that you should prepare an SEO profile for a blog post, you should prep one for every comic you upload. Here’s what it looks like. Filling out the form is pretty straightforward is you keep in mind one thing: Everything hinges on the keyword (or words). So your SEO is going to improve the more consistently that keyword shows up in certain places on your site. And that’s what Yoast does. 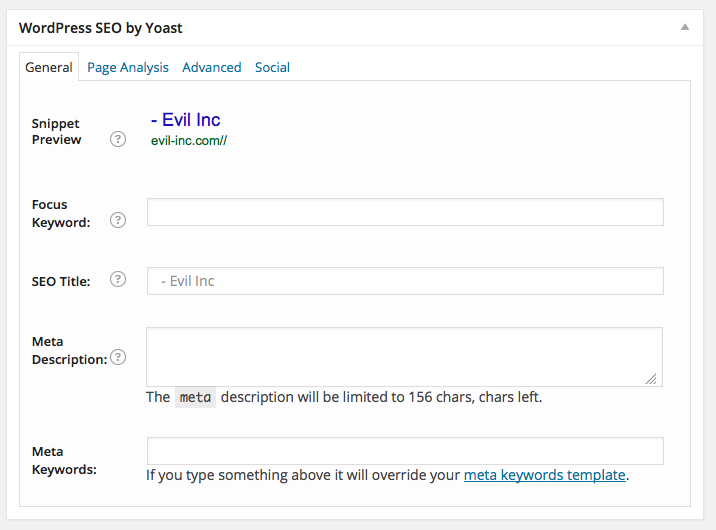 It reminds you to put the keyword in your title, in the meta description, in the page URL, in the blog itself, and so on. Here’s the form filled out for the example from above. As you’ll note from the above graphic, I’ll get a green-text approval for each one of these categories I satisfy. 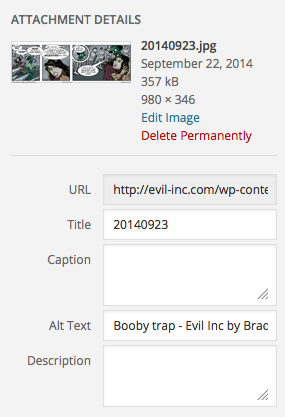 Heck, I even put my keyword in the Alt text for the comic’s image file. It’s all in the comic title. Being the creative types we are, we feel the need to come up with a clever title. But this is the last place to be clever! In fact, I’ll argue that this is the place to be as un-creative as possible — or maybe, just creative in a different way. Because that title has to feature a keyword. And that keyword is the word that you expect people to punch into a search-engine field and (hopefully) find your comic. And if your keyword (and, therefore, title) features a cute play on words, the chances diminish that someone would use that phrase in a search. 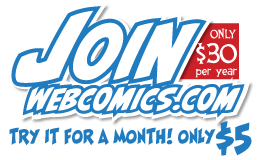 Because (A) it applies to the comic, and (B) it’s a phrase that I assume would be used in several search-engine searches. I love this, but the fact that this update wasn’t titled “Burn” or something along those lines disappoints me a little. And I mean that in the nicest way if that’s possible. It’s understandable. They’re certainly not thinking SEO as they’re enjoying the Web site. And, to be fair, “burn” would have been an acceptable title, too. Those are much more clever headlines, but there’s a much more slim chance that people will put them into a search-engine search. And SEO hinges on exactly that process. So my headlines are always plane-jane keyword headlines that are chosen on the basis of words and phrases that I judge to be common search terms. I’m not counting on their entertainment value. The words don’t appear on the main page (and they’re an afterthought on the archive pages). And my comic is plenty entertaining without cute titles. That’s not a job that I want them to do. The role those words play on my site is pure-and-simple SEO.